A decree signed by Vladimir Putin has lifted a self-imposed Russian ban on the sale of S-300 air defense missile systems to Iran, AFP reports. The lifting of the Russian weapons embargo comes days after the P5+1, the European Union, and Iran agreed on a landmark outline deal over Tehran’s nuclear program on April 2, in Lausanne, Switzerland. As a consequence of the UN Security Council resolution of June 2010 imposing sanctions — which included a ban on the sale of hi-tech weapons — Russia cancelled the delivery of the missiles and stopped all military-technical cooperation. In return, Iran demanded $4 billion in compensation. The Lausanne agreement (the Joint Comprehensive Plan of Action) established a framework for a comprehensive nuclear deal to be reached by the end of June. Should a final agreement be signed, economic sanctions currently imposed could be gradually lifted, according to U.S officials. “We are convinced that at this stage the necessity for a separate and voluntary embargo by Russia has disappeared,” Russia’s Foreign Minister Sergei Lavrov said in a statement today. He noted that Russia voluntarily suspended the missile sale in 2010, although it was not covered by the sanctions imposed by the U.N. Security Council on Iran. Foreign Minister Sergei Lavrov pointed out that the missiles were “exclusively defensive” and that the missile system “does not have attack capabilities and does not put any state in the region in danger, including Israel.” The delivery date of the Soviet-era missile systems is unknown. As I have reported a while back (see: “Russia and Iran Sign Military Cooperation Agreement”), Russian Defense Minister Sergei Shoigu and his Iranian counterpart, Defense Minister Hossein Dehghan, signed an intergovernmental agreement on “long term and multifaceted” military cooperation in Tehran, Iran on January 20 of this year. Back in January 2015, both ministers also agreed to settle their differences once and for all regarding the sale of five S-300PMU-1/SA-20 Gargoyle SAM systems (40 launchers) to Iran for $800 million. The S-300PMU1 is a long range, Surface-to-Air Missile (SAM) system, “designed to engage aircraft, cruise missiles and theater ballistic missiles in intense clutter and jamming environment,” according to deagel.com. Back in 2000, Iran was the fourth largest importer of Russian military equipment placing right after China, India, and the United Arab Emirates, buying 6.1 percent of Russia’s total arms exports. According to a study by the Center for the Analysis of World Arms Trade in Moscow, the Russian defense industry has lost around $13 billion in arms sales due to UN sanctions against Iran. In February, Russia also offered to sell more advanced Antey-2500 missiles to Teheran instead of the S-300 SAM systems. 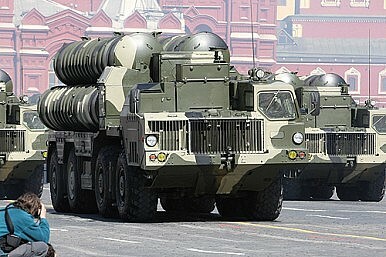 Russia already exported this improved version of the S-300 to China, Vietnam and Cyprus.